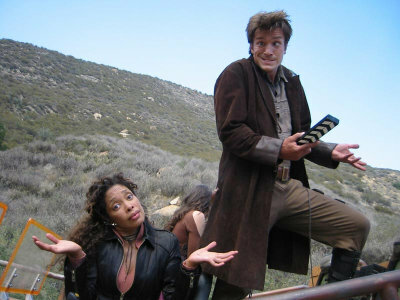 Here's Firefly's Zoe and Mal but what is the caption? Zoe: "What do you get if you have a green ball in this hand and a green ball in that hand?" Mal: "I am gorramed if I know....."
Zoe: "The Jolly Green Giant's undivided attention....."
Mal;"Er,Zoe.You know that tea you brewed a little while ago with those funny little mushrooms we found on the hill-side...."
Zoe: And THAT'S what happens when you give a wedgie to a man already known for his tight pants. Mal's entry in the Serenity annual gurning competition drew a so-so response from Zoe. Is Zoe saying "why do men ALWAYS take charge of the remote control?"